Straight Retro Style Glamour Pop Rock Star BLACK with BLOND FROSTED HIGHTLIGHTS. Fancy Dress accessories for aspiring heavy metal music celebrity icons, both Men and Women! Crazy mullet layered head banger cut. 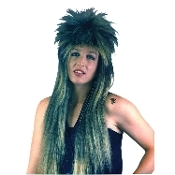 Funky Eighties throwback accessory for any aspiring Lady Gaga, Pink, wild movie star or pop singing icon costume! •Easy Care, Non-Flammable, Long, Synthetic Wig. •Elasticized lining for a comfortable fit. •Standard- One size fits most Ages 12+. •Use for theatrical, cosplay, dress-up and costume parties. •Wig is new in package and will require some gentle style. Individual results may vary. •The wig is packed with the plastic packaging to ensure arrival in perfect condition. **We cannot accept wigs for return unless they are in their original packaging, unopened, unworn and sealed.